It was back in February of this year that I was first introduced to the Japanese whisky, Nikka Coffey Grain and let me tell you, Japanese whiskies still continue to impress me. The Nikka Coffey Grain is by far one of my favorite Japanese whiskies, however most recently I had the 12 year-old Taketsuru Pure Malt and this Japanese whisky doesn’t fall too far behind in taste. 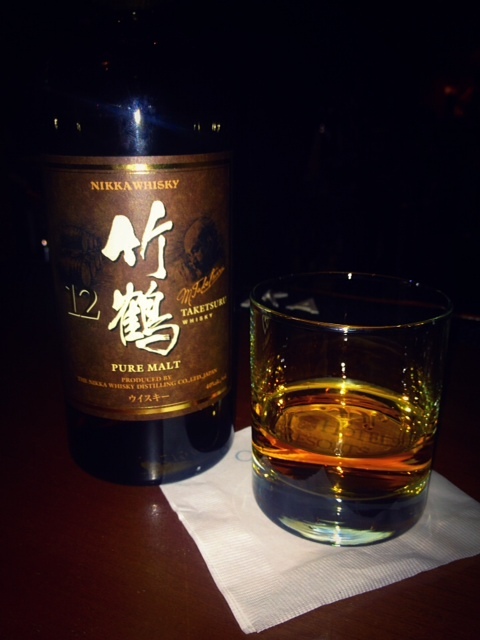 The Taketsuru Pure Malt is a blended whisky that combines Nikka single malts Yoichi and Miyagikyo. It is named after its founder Masataka Taketsuru. As mentioned in my Coffey Grain blog post, Nikka is a big Japanese whisky producer, which first established its distillery in 1934 by Taketsuru. Taketsuru came from a sake producing family and fell in love with whisky. That brought him to attend the University of Glasgow and he eventually left as a master blender along with the young Scotsman Jessie Roberta who became his wife. Although I keep saying the Coffey Grain is still my favorite, it really isn’t by much. This 12 year-old is balanced and extremely well made. Considering the price of other 12 year-olds it might be a little expensive. I saw it priced between $69-$80. Yes, it is slightly overpriced, however, I’ve had many 12 year-old whiskies that are subpar, this one, is not one of them. It is a delicious whisky that is young but well worth the price and I do recommend trying. PS: Look for my bonus post on Halloween! This sounds fantastic! I’d be keen to try it – if I could only track down a bottle in these parts. The Yoichi is my favourite Japanese whisky – and I recently learned how to pronounce Miyagikyo properly – so it sounds like a good combo! Ah, I have not tried the Yoichi or Miyagikyo individually. I will have to look for them to try. Japanese whisky has really surprised me. Japan have been putting out some really good quality products out.